When the program finishes loading, the splash screen disappears and the workspace is displayed. 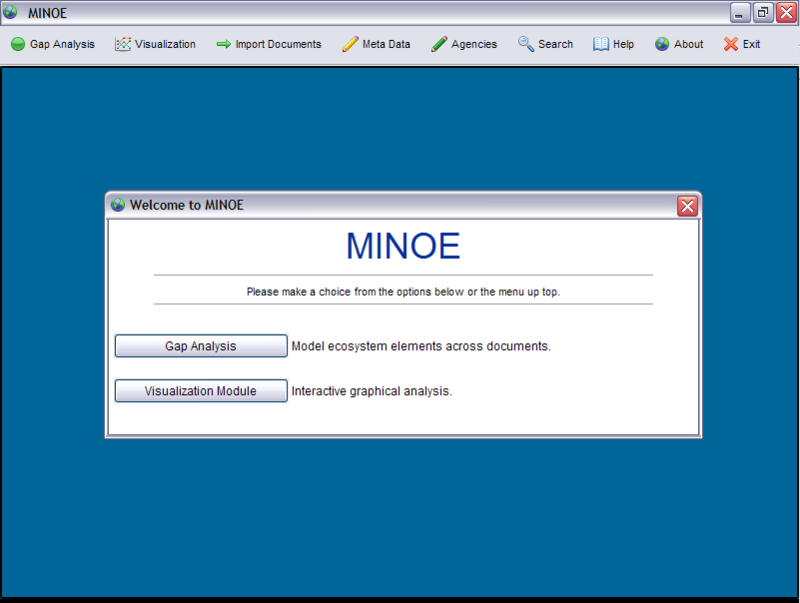 The workspace manages all of the windows that MINOE will be using. Gap Analysis - Opens the Gap Analysis module. Visualization - Opens the Visualization (graphing) module. Import Documents - Opens the Import Documents module and displays a folder asking for the location of your documents to import. Meta Data - Opens the Meta Data Editor. Agencies - Opens the Agencies Editor. Search - Opens the Search module for doing standard keyword searches. Help - Opens the Help module. About - Displays the About screen. Exit - Quits the program.